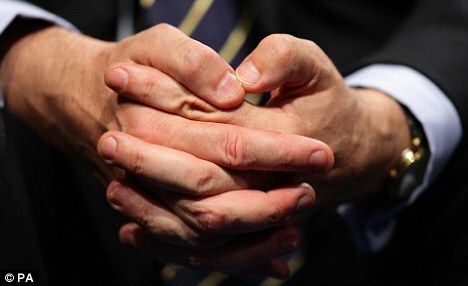 MAY 18, 2008 + OCTOBER 7, 2009 UPDATE: DID GORDON BROWN STOP BITING HIS FINGERNAILS? Fidgety, ink-stained and with nails bitten to the quick, Gordon Brown's hands are fast becoming a visible symbol of the pressures he is under. "Since he became prime minister, Gordon Brown looks cared for above the eyebrows - he has had a decent haircut". That's the pithy verdict of Veronique Henderson, co-author of Style Matters for Men. "But nobody has told him about his hands. His stained fingers say: here is a man that does not look after himself, and who does not care about his image. And he is chewing on his nails - a sign of a nervous and worried disposition." It's not only stylists who see significance in hands. Experts from fields as diverse as palmistry and biology say it's the hands - not the eyes - that provide the most revealing insights into a person's character. As far as occupations go, common sense tells us that a writer or an office worker is likely to have soft hands, while the expression "horny-handed son of toil" aptly reflects the damage done by manual labour. To the great detective, Sherlock Holmes, such a theory was elementary. "By a persons' fingernails... by the callosities of his forefinger and thumb... by each of these things an individual's calling is revealed." It was a lesson learned well by the Khmer Rouge, which ruled Cambodia during the 1970s. In a bid to root out individual thinkers, Pol Pot's soldiers would routinely examine people's hands. Those with soft palms were deemed "intellectuals" and despatched to the Killing Fields. Yet hands also allude to a person's age. A study by the American Society of Plastic Surgeons found that most people who were shown photographs of a female hand were able to accurately estimate the subject's age. The most common giveaway, say researchers, is prominent hand veins, something that can be overcome - at least in the short term - by holding the hand up in the air so the blood drains away, says Steve Barker of the model agency Hired Hands. "It's an old hand-model trick, and is routinely used to make a person's hands appear younger than they really are." But while a person's hands may indicate their age or occupation, practitioners of chiromancy - or palmistry - believe the appearance of a person's hands can offer more revealing insights. Palmist Paul Hughes Barlow, who practices beneath Brighton pier under the name Punditt Maharaj, says the shape of the hand, the lines that run across it and the way the fingers are held all indicate a specific personality; even a person's future. "The hand is something you use to express yourself - the inside of the hand is secret and reveals a lot of what you think and feel," he says. 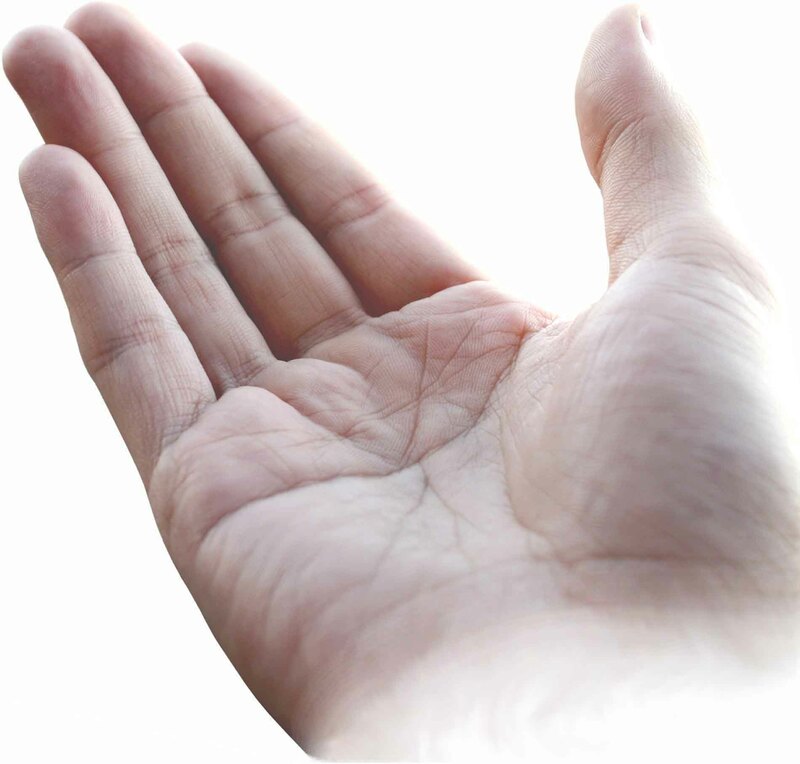 Whilst many scientists are dismissive of palmistry, they do believe that the shape of the hand, or more specifically the relative size of the index and ring fingers, can provide accurate information about an individual. Research by Professor John Manning, author of The Finger Book, suggests those with a long ring finger compared to their index finger are more likely to excel at sporting activities. Those with larger index fingers are more likely to be sociable. "It is all to do with the amount of the hormones testosterone and oestrogen produced by the foetus while it is in the womb," he says. "More testosterone is indicated by a relatively large ring finger. More oestrogen shows up as a longer index finger." The relative sizes of Gordon Brown's index and ring fingers are not recorded - so his testosterone levels are difficult to assess. But Ms Henderson, who is also creative director of the style agency Colour Me Beautiful, says if the prime minister wants to work on his image, he needs to take urgent action on his hands. "If everything was going well for him, he might get away with those fingers. But in current circumstances he needs all the help he can get." Gordon Brown's fingernails in 2007 Gordon Brown is known for many as a 'chronic' nail-bitter. In september 2009 The DailyMail reported that Gordon Brown's fingernail condition has recently improved very much! At the TUC conference the photo below was made, indicating that Gordon Brown might have lost the habit of biting his fingernails!